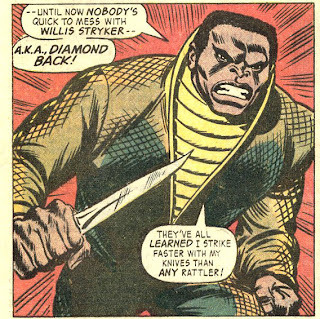 Willis Stryker is initially the best friend of Luke Cage but the two have a falling out and the two become bitter foes. The Stryker dies early in the comic series but stands out as a kind of nemesis of Luke Cage. Willis Stryker aka Diamondback is played by actor Erik LaRay Harvey. Willis Styker and then Lucas (He changes name to Luke Cage later) are in the same gang called the Rivals. Together the two battle their rival gang the Diablos and commit a variety of petty thefts and crimes. They dream of becoming rich crime lords. Lucas decides to go straight and leaves the Rivals. This angers Willis Styker to an extent but their relationship is going to be made a lot worse. Styrker continued to climb the criminal ladder and is confronted by a group called the Syndicate who wants him out of their turf. When Styker refuses the Syndicate begins to savagely beat him. Lucas jumps in and saves his old friend. Reva Connors who is Stryker girl friend is horrified by the violence that Stryker's dirty line of work has landed him in. She and Lucas plead with him to go legit while he recovers in the hospitable. A furious Styker believes that Lucas has poisoned her mind and kicks them both out of his room. Now Stryker is mad at Lucas for leaving the gang, and for taking his girl. He then sets in the motion the scheme that changes Lucas's life forever. Styker plants herion in Lucas's appartment, tells the police, then watches as they hawl off Lucas. Stryker then tries to make amends with Reva but the syndicate attacks and Reva ends up being killed. Luke now in prison is furious at Stryker for setting him up, and killing Reva and vows to get revenge. When Lucas escapes prison it is only a matter of time for the two to meet. Lucas at this time has escaped and become the hero for hire, Luke Cage. Stryker had become an agent/hitman of the Syndicate and now used a variety of high tech knives that he would throw. The two battle and Stryker ends up dieing in the conflict. No real powers but is very skilled at fighting with and throwing knives. Stryker uses a variety of high tech knives that explode, release poisions or sonic disruption to maim and kills his opponents. 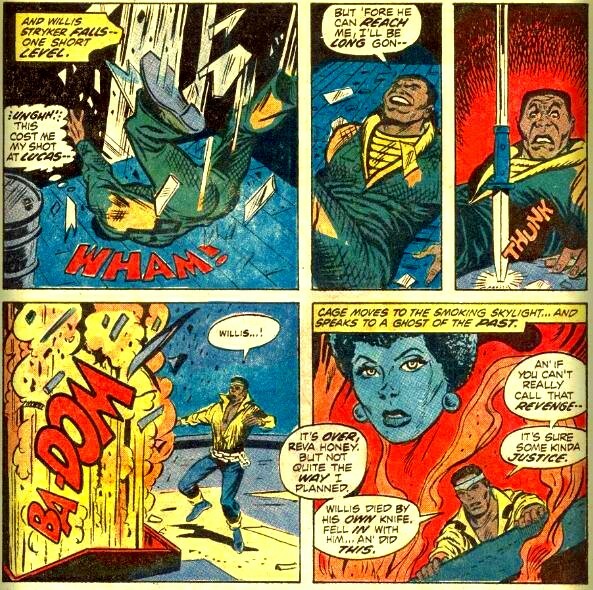 Willis dies while battling Luke Cage. He falls through a skylight and crashes to the ground and one of his exploding knives does as well. The resulting explosion kills him. Willis Stryker is set to appear as a villain in the Luke Cage Netflix series. Willis Stryker aka Diamondback is played by actor Erik LaRay Harvey. Luke Cage runs through armies of common criminals who are unable to stop him due to his super strength and seemingly impervious skin. However, a villain who has followed Cage for long time appears with equipment that is designed to give Cage a challenge and this villain is Diamondback aka Willis Stryker. Much of the first part of the season focuses on Cage's struggle with local gangleader Cornell Cottonmouth and his politically powerful cousin Mariah Dillard. This battle involves him battling for the soul and leadership of his neighborhood of Harlem against grounded foes. Despite the challenges he faces in dealing with Cottonmouth he is never faces a real physical challenge. This is were Diamondback comes in. Diamondback is an arms dealer who access to advanced weaponry. Including weapons that have alien (Chitauri) technology that can presumably hurt Cage. It is also revealed that Willis and Luke are half brothers. Unlike in the comic version Diamondback does not seem to be fully dead in the end of the series. This is actually similar to a different Luke Cage comic villain named Coldfire. Coldfire developed some weird super powers of creating cold fire doppelgangers of people. In the end of the season 1 Willis is put under the care of Doctor Burnstein and it is possible that he could return with similar super powers. Some people have said that Diamondback's more comicbooky appearance and fighting style leads to a clash between the grounded first part of the season. Others have also said they did not like how Diamondback smiled throughout the fight. Well, in a sense, this is a game to him. I think truly deep down, inside, he still loves Carl. That’s the funny thing about family, right? You hate ‘em but you love ‘em. You love ‘em but you hate ‘em. [Laughs] It’s one of those situations. He remembers a loving time they had before they had the mess, so [the thinking] is partly like, “I really need to hurt him but I don’t want to kill him.” So it becomes this game, and I think the smile is just the mask he wears with everyone. It’s not genuine. He’s not trying to be nice or to befriend anyone. It’s just his way of dealing with his pain. He smiles through his pain. Generally I understand these criticisms but I think fans of the character realize that Luke has many fun but less grounded villains. In the end Luke Cage exists in a comicbook world full of aliens, demi-gods and mutants or......Inhumans. I think breaking this wall from grounded reality into more unbelievable aspects of the MCU is important. My only change is that I would not have grounded the first part of the series so deeply. I would have given Cottonmouth some outlandish Thugs like Mr Fish or Spear. This may have made this transition less jarring. I still felt the show managed to be both a comic book show and also strike upon serious social issues which was one of its goals.